Erin King, a 17-year-old student from Georgia, sent her MIT acceptance letter on a high-flying journey to near-space. Picture this: You're a senior in high school and you just got accepted into the Massachusetts Institute of Technology. How do you celebrate? Seventeen-year-old Erin King of Georgia aimed high … really high. King sent a tube containing her MIT acceptance letter on a high-flying balloon ride to near-space. The canister, which was equipped with tracking devices and an onboard camera, reached a maximum altitude of approximately 17.2 miles (27.7 kilometers) before falling back to Earth. King posted a video of the entire flight, which included footage of preparation work beforehand, on Youtube. The camera, which was mounted onto the tube containing the admissions document, captured stunning views of the landscape below and the horizon, before drifting down into a field of trees. "It landed just east of I-75 and south of Cordele, GA," King wrote in a description of the video. "Ironically, it decided to land in a small patch of trees surrounded by cotton fields. (We were aiming for the fields.) Luckily, it wasn’t very high up and we were able to recover everything safely. It was fun!" MIT has been sending out acceptance letters to students in tubes, and the school challenged the potential newcomers to "hack" them in creative ways. 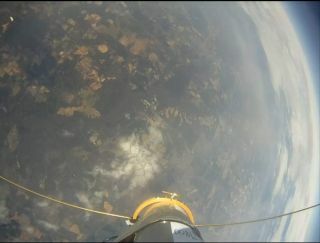 King, who has worked on balloon experiments before and is a Ham Radio operator in her spare time, came up with the idea to turn her tube into a high-altitude balloon experiment. "I decided to do this project because I just thought it would be fun. (And it was!)" King told SPACE.com in an email. "I wanted to build on my previous experiences and to honor and thank MIT by doing something cool and conducting this balloon mission of my own." The entire project took about three weeks to plan and execute prior to the launch, she added. King's sky high acceptance letter is the latest example of do-it-yourself balloon experiments. Last month, two 17-year-old highschoolers from Toronto, Canada sent a weather balloon with a tiny Lego man holding a Canadian flag to near-space. The video became an internet sensation. For her part, King attached her tube to a helium-filled weather balloon, and launched it at around 1 p.m. local time from Lumpkin, Ga. on Jan. 16. The entire flight lasted about two hours, she said. "We traveled to Lumpkin for the launch because we wanted to launch from an ideal location from which the winds would carry the payload to land in a farmland region, rather than somewhere like a dense forest or a swamp," said King, who is from Columbus, Ga. "We used a software algorithm to predict the wind patterns based on current weather information from regional airports." The tube carried two GPS-enabled ham radio transmitters, which allowed King to track the payload from the ground. She also collaborated with her father to make custom antennas for the radios that were used in the flight. For her so-called "TubeCam," King used a GoPro Hero camera that recorded HD video of the flight, she wrote in a description. The clever Georgia teen is planning to join MIT's class of 2016, studying electrical engineering and computer science. MIT featured King's balloon project and other responses to their challenge on a special website called Hack the Tubes 2012. SPACE.com producer/editor Steve Spaleta contributed to this report. You can follow SPACE.com staff writer Denise Chow on Twitter @denisechow. Follow SPACE.com for the latest in space science and exploration news on Twitter @Spacedotcom and on Facebook.